>It’s your wealth of information supported by medical literature that I love. Thank you! Such praise keeps me going. The reason not to apply vit. A cream or any other cream right after applying vit. C serum is because vit. C is water-soluble and it has difficulties penetrating oils. If you apply a cream right after vit. C, the cream may prevent vit. C penetration into the skin. (Water and oil do not mix unless you use an emulsifier). You can apply any cream after vit. C serum but first wait for the vit. C to be absorbed. >I also have a question about the pure vitamin C. Does it expire? I have just checked the ascorbic acid powder container we're selling and the expiry date is three years from the manufacturing date. As long as you keep the vit. C cool, dry, dark and in an airtight container (the ziplock bag is airtight), it will last years. Yes I have. Hypertrophic scars often flatten, soften and improve in color amd texture after repeated needling. They will not disappear (unless superficial) and they do not shrink in size, except for flattening. They became much less visible. The only reason I did not recommend applying Aloe vera right after dermarolling with long needles is because, depending on the percentage, Aloe vera is quite a strong anti-inflammatory. Suppressing inflammation is very useful with chronic inflammatory conditions or "ordinary" injuries. However it is not very helpful to suppress the short lasting, mild, controlled inflammation that occurs for an hour or two right after dermarolling because the inflammation triggers collagen production and other processes. In case of dermarolling this short lasting, mild inflammation is desirable. In other cases, it is fine to use Aloe vera. Avoiding strong- anti-inflammatory only applies right after dermarolling and I have to remove the part of my sentence "and a couple of days after". It was a mistake, I'm sorry. Davis RH, Donato JJ, Hartman GM, Haas RC. Department of Biomedical Sciences, Pennsylvania College of Podiatric Medicine, Philadelphia. Aloe vera improves wound healing and inhibits inflammation. Since mannose-6-phosphate is the major sugar in the Aloe gel, the authors examined the possibility of its being an active growth substance. Mice receiving 300 mg/kg of mannose-6-phosphate had improved wound healing over saline controls. This dose also had anti-inflammatory activity. The function of mannose-6-phosphate in A. vera is discussed. Processed Aloe vera administered topically inhibits inflammation. Aloe vera preparations were evaluated for topical anti-inflammatory activity using the croton oil-induced edema assay. The results show that small amounts of A. vera given topically will inhibit inflammation induced by a moderate amount of irritant. In general, the decolorized Aloe was more effective than the colorized Aloe (with anthraquinone). A 47.1% inhibition of inflammation was obtained by 5% decolorized irradiated Aloe. These results may be used as a baseline to assess the biologic activity of A. vera in the treatment of inflammation by podiatric physicians. > single needling might help me. > Thank you for any information you can provide. Sebaceous Hyperplasia is the harmless enlargement of sebaceous glands. The glands are hormonally controlled and produce an oily sebum that lubricates the skin. If you got them during or after pregnancy, they will likely disappear by themselves as soon as the hormonal levels go back to normal. I doubt dermarolling could make the glands smaller. It could perhaps help normalize the skin physiology just like dermarolling often helps skin that is prone to acne. Yet, I do not think dermarolling will really help in case of Sebaceous Hyperplasia. In acne, sebaceous glands greatly overproduce sebum and this overproduction clogs skin pores, which causes acne (there is still very much unknown about acne but sebum overproduction is a main factor for acne formation). Dermarolling speeds up the turnover of the skin and that helps unclog pores and often improves acne-prone skin. In Sebaceous Hyperplasia, the sebum-producing gland is enlarged but it doesn't produce excessive amounts of sebum and that is why I doubt dermarolling could affect the size of the gland and improve this cosmetic condition. Sebaceous Hyperplasia nodules are treated just like warts or skin moles. They are mechanically removed by laser evaporization, liquid nitrogen, cauterization, acid peels or they are shaven off etc. If you intensively single needle the Sebaceous Hyperplasia nodule, the subsequent peeling may make it smaller but I am just hypothesizing. I am sorry I can't give you a totally clear-cut answer but dermarolling is a new method and there are dozens of skin conditions where the benefits of dermarolling have yet to be established. I have not heard from our customers about experience with this. I think you will be better off with mechanical removal. >I wanted to know if vit A oil ( vit A + Soy Oil) is considered to have the same benefits as retA? The best is vit. A in the form of Tretinoin (Retinoic acid). Other forms of vit. A are converted to Retinoic acid in the skin so any form of vit. A is useful, however in order to achieve high concentrations, using Retinoic acid is the most appropriate regarding stretch marks. You should apply your vit. A oil over the A-Ret. It will add extra vit, A and the oil will moisturize the skin. >Is it good that stretch marks after treatment (dermarolling or needling+ Vit C or Vit A oil) actually stay purplishy red (up until 3 weeks) ? (Before they were small white lines). >Does that mean that blood circulation has been rebuilt? (been rolling for 4.5 months). It means that the stretch marks are being "worked on" and this process will hopefully remodel the stretch marks and make them look better. >Can there appear new stretch marks from losing weight or are those just the old ones getting more noticeable? In spite of the fact that stretch marks are supposed to be a result of skin stretching, many people experienced getting stretch marks during rapid weight loss. Either the stretch marks formed during the weight gain and the lost volume during the weight loss made them look more deep and wrinkly or they somehow formed during the weight loss. Surprisingly, detailed mechanism and cause of stretch marks formation is not fully known. There seems to be both hormonal and skin stretching aspect. >Some skin peeling has started to happen, good/bad? >What are the contents to be looking for in a drugstore kind of a stretch mark/prevention cream? 1 - Hyaluronic acid vitamin A, vitamin E, dexpanthenol and allantoin. I am pleased to hear this. >So can I use the 1.5 mm roller+ needles directly on them + oils/ creams and hope for better results? What would be the best way to treat them? Roll the whole area (stretch marks and surrounding skin) once every five weeks with the 1.5 mm dermaroller and then in addition, treat every stretch mark individually once every five weeks with the single needle. If you have a lot of stretch marks and don't have the time to treat them all at once you can spread out the treatments with the single needle over the five weeks but make sure to needle each individual stretch mark only once during this time. 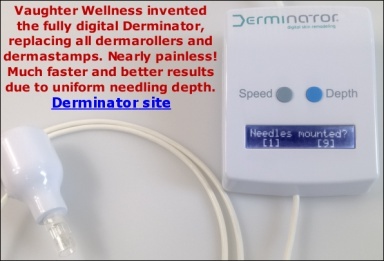 When you have finished this individual needling of all stretch marks in the area (try to finish it in four weeks), give your skin a week off and then start the whole process over again - rolling the entire area with a regular dermaroller and using the single needle. After two months, give your skin a one-month break. Then restart the whole process and after two months give your skin a one-month break and restart again, etc. There are studies showing that A-Ret (Tretinoin) slightly helps diminishing fresh (red) stretch marks and it has some limited effect on mature (white) stretch marks as well. Right after needling the stretch marks, apply A-Ret gel. I do not recommend using A-Ret right after dermarolling because it is acidic and it stings when applied to the rolled skin but in some special cases such as stubborn scars and stretch marks, I do recommend it. (Do not use A-Ret if pregnant, breastfeeding or planning pregnancy). Yes, you can use a narrow 1.5 mm dermaroller around the eyes but please read how to roll around the eyes. A 0.5% solution is a ratio of 1::200, so you would have to see how many soup spoons go in half a litre of water. Best is to take a 25 or 50 ml measuring cup and fill it by using that particular soup spoon, then "calculate up". I can't comment on nutritional issues because I simply have a full time job answering questions (giving support) pertaining our products. Yes, A-Ret and Ret-A are the same. It contains Tretinoin = Retinoc acid. No, we do not stock the 0.1%. The more is not always the better, regarding Tretinoin. Dermarolling / Microneedling / When to use a PCA skin peel? Wait at least two weeks. Do not perform any peels if you still have scabs from needling. Dermarolling / Microneedling / Old leg scar/ will dermarolling help? Use the search function to find more on various topics. Matrixyl™ 3000 contains glycerin, water, butylene glycol, carbomer, polysor- bate 20, palmitoyl oligopeptide, palmitoyl tetrapeptide-7. You can use the above mentioned skin products with a 0.5 mm dermaroller but I cannot comment on their efficacy. I can only guarantee that their penetration will be greatly enhanced with dermarolling. No, you do not need a 0.2 mm if you have a 0.5 mm dermaroller. Dermarolling / Microneedling / Can't find proper disinfection alcohol? Every second day or less, it depends on how the skin reacts. If the skin gets irritated, red of flaking then reduce it to every third day for example. Yes, but you should wipe it off before you roll. Don't roll it in.